CHARLOTTE, NC – Registration is now open for a signature event that ushers in the start of the Carolina Panthers’ season, the Carolina Panthers’ Countdown to Kickoff Luncheon presented by Electrolux. The 12th annual event will be held at the Charlotte Convention Center on Wednesday, August 21st from 11:45 a.m. to 1:15 p.m.
Group tables and individual seats may be purchased through the Charlotte Sports Foundation’s website at www.charlottesports.org/countdown. The luncheon will feature an introduction of the entire 2013 team, silent auction and performances by the Top Cats, PurrCussion Drumline and Sir Purr. Event proceeds benefit Carolina Panthers Charities in support of three vital team community partners: Classroom Central, Levine Children’s Hospital, and the USO of North Carolina. “The Charlotte Touchdown Club is honored to co-host this fantastic event in conjunction with the Carolina Panthers and Charlotte Sports Foundation. We are also very proud that the funds raised will benefit such deserving charities” said John Rocco, Executive Director of the Charlotte Touchdown Club. “The Countdown to Kickoff Luncheon is a great opportunity for the community to meet the team and hear about the upcoming season. We are grateful for the opportunity to be involved and support such worthy charities in the process,” said Will Webb, Executive Director of the Charlotte Sports Foundation. Presenting sponsor Electrolux, whose North America headquarters have been in Charlotte for three years, is donating high-end, premium kitchen appliances for the silent auction. Additional sponsors and partners for the event include TimeWarner Cable, News Talk 1110 WBT AM and Conder Flag. The Carolina Panthers’ Countdown to Kickoff Luncheon is hosted annually by the Charlotte Sports Foundation and Charlotte Touchdown Club. The Charlotte Sports Foundation is a non-profit, 501(c)(3) organization whose mission is to provide leadership for sports-based initiatives that enhance the economy and quality of life in the Charlotte region. We provide unique events and sports business opportunities around professional, collegiate and amateur events, highlighted by the Belk Bowl and the Dr. Pepper ACC Football Championship. The Charlotte Touchdown Club is a 501(c)3 non-profit organization founded in 1991 for the purpose of promoting high school, collegiate, and professional football in the Charlotte, North Carolina region. Since its inception, the club has grown as well as diversified, boasting a sponsor team of more than seventy companies. The Club’s activities and services focus community attention on the outstanding Citizenship, Scholarship, Sportsmanship, and Leadership of area athletes and coaches. Through individual and corporate support, more than $1,500,000 has been raised to benefit the Touchdown Club’s scholarship efforts. For more information on the Charlotte Touchdown Club please visit www.touchdownclub.com. Electrolux is a global leader in household appliances and appliances for professional use, selling more than 50 million products to customers in more than 150 markets every year. The company focuses on innovative solutions that are thoughtfully designed, based on extensive consumer insight, to meet the real needs of consumers and professionals. Electrolux products include refrigerators, dishwashers, washing machines, cookers, air-conditioners and small appliances such as vacuum cleaners sold under esteemed brands like Electrolux, AEG, Eureka and Frigidaire. In 2012 Electrolux had sales of $16.3 billion ($5.1billion in North America alone) and 58,000 employees. 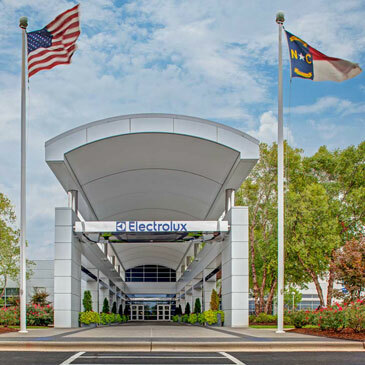 The Electrolux North American headquarters is located at 10200 David Taylor Drive, Charlotte, NC 28262 in University Research Park, where they have been based for three years. For more information go to http://newsroom.electrolux.com/us/.